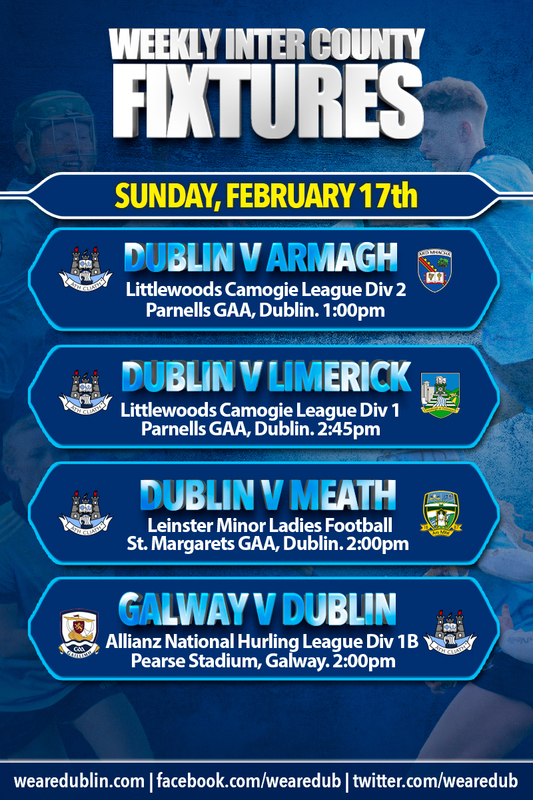 We’ve a huge Sunday of action this weekend with four Inter County Fixtures. The weekend just gone we witnessed the Dublin Senior Footballers suffer their second defeat of the Allianz League Campaign. But it was a close run game in Tralee with Kerry just edging it with a score in the dying seconds. On Sunday Mick Bohan’s Senior Ladies put in a massive performance against Tipperary in Ardfinnan. The game was pretty much done and dusted at half time. But Dublin registered 6 goals during the contest to run out comfortable winners. This weekend the action continues for both our Senior and Intermediate Camogie panels. The Dublin Senior Hurlers are in National League action. And the Minor Ladies Football panel begin their Leinster Championship journey. Its been a longer wait than usual. But reigning All Ireland Premier Junior Camogie champions Dublin get their League Division 2 campaign started with an opening day home game against Armagh. This game is one part of a double header of Camogie on Sunday afternoon. 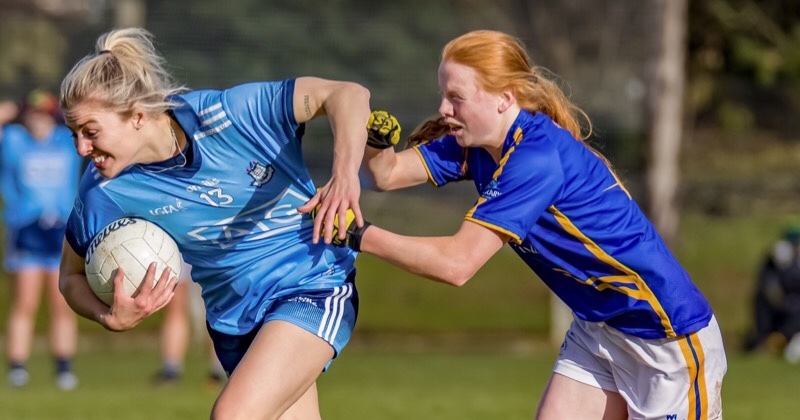 The girls in blue had a massive 2018, winning the All Ireland title and moving up the ranks to Intermediate level. But they also reached the Division 2 Semi Finals in their first year at that level. All the game time and experience they’ve picked up since then will stand to them. Frank Browne takes the helm once again for his third league game in charge of the Dublin Senior Camogie panel. Mixed fortune so far with the girls losing to Kilkenny on the opening day, and drawing last a week later with Offaly. Limerick are two for two so far, with wins over Offaly and Clare. But Dublin can’t be ruled out for a win just yet, both this weekend and in their final game against Clare. Everything still to play for. Two good performances would see them pick up 6 vital league points and put them in a great position. On April 29th last year, Dublin’s Minor Ladies retained their much loved Leinster Championship Crown, having beaten Meath in Coralstown on a score of 2-13 to 2-05. And this year Meath are Dublin’s first opponents. With home advantage on their side, the Dubs will be hoping to get their campaign off to a winning start. Last year’s Dublin Minor team featured players like Kate Sullivan, Niamh Hetherton, Hannah Leahy and Sarah Fagan. And it’s a great testament to the work put in at this level to see these girls dipping their toe in the Senior grade this year. There’s no doubt there will be more new talent on show starting this weekend. It’s match number three for Mattie Kenny and his Dublin Senior Hurling panel. And this game could be the one that makes or breaks their League campaign as they take on a very strong Galway side. We’ve seen them already in Walsh Cup action, with Dublin fighting back to draw level with the Tribesmen, only for Joe Canning to fire over a sideline cut to give his side the narrowest of wins. But there’s lot more at stake this weekend, particularly with Galway dropping points against Carlow at the beginning of the month. They’re now chasing Dublin and Waterford at the top of the league table. Dublin have won convincingly against Carlow and Offaly, and will face Waterford after this weekend’s clash in the west. And that’s the games happening this weekend. Make sure you get one in.